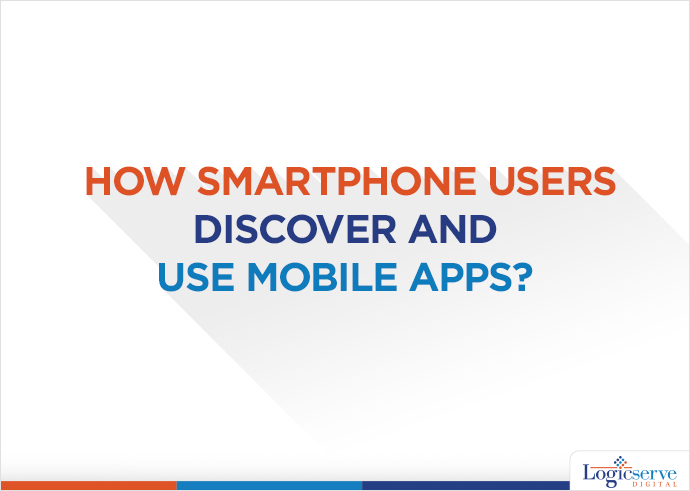 How Smartphone Users Discover and Use Mobile Apps? Analysing the behaviour of users for discovering apps can help mobile app developers to come up with the right strategies for promoting their mobile app. Now let’s discuss the top motivating factors that excite people to install apps. Mobile apps have become an essential part of our lives. They are downloaded by people almost every day from the two popular app portals— Google Play Store or Apple App Store where users can discover, purchase and download interesting mobile apps for streaming music, tracking fitness, online shopping, cashless banking, and much more. However, app stores are not the only means to find out new apps. Based on some astounding statistics generated by a survey carried out by Google and Ipsos MediaCT, this post will elucidate how people discover and use new mobile apps from app stores to suit their requirements. 1. Word of Mouth—The top channel for discovering apps: Word of Mouth stands out as the most reliable source of information that influences purchasing decisions. The study conducted by Google and Ipsos revealed that recommendations by friends and family act as the topmost way of discovering new mobile apps. Since consumers are becoming more cautious about downloading new apps, encouraging users to use a particular app is not easy unless it has been tried and tested by their friends or relatives. According to the survey, 51 percent of users download apps based on recommendations from those they trust. 2. Browsing the App Store — According to the survey done by Google and Ipsos, 48 percent of smartphone users rely on app stores for discovering new apps. Apps stores feature a search function to allow smartphone users to find out new apps that they might have heard about from their friends or work buddies. 3. Social Networks/News Portals/ and Blogs — 32 percent of smartphone users, according to the survey, discover apps as they see them shared on social networks. It goes without saying that app developers are making the best use of social media platform to promote their apps. News and updates shared on social platforms such as Facebook, Twitter and LinkedIn not only help people discover new apps but also persuade them to install the app. The survey further states that 32 percent of surveyed users have discovered new apps by reading about them online. There are countless blogs and online portals that provide the latest information about mobile apps to inform readers about some of the most incredible innovations. 4. Browsing the search engine — According to Google, one in four mobile apps is discovered by users through ads on a search engine. Thus, search engines are another good source of discovering mobile apps. 31 percent of smartphone users, according to the survey have discovered apps after watching ads on search engines. 5. Ads on TV or YouTube — In order to reach more audiences, app developers are increasingly cashing in on TV ads as commercials are a great way to convince users to install mobile apps. 26 percent of smartphone users who were surveyed by Google and Ipsos opined that TV commercials persuaded them to install certain apps on their smart phone. Similarly, YouTube ads also play a key role in increasing app installs, as 20% of users stated that they have installed mobile apps after watching its ad on popular video-sharing website YouTube. 6. Through Search Engines— The survey further reveals that 21 percent of users discover apps through the search engine. Search engines thus act as one of the key drivers of app discovery. 7. Recommendation from app stores — While downloading an app from an app store, a list of recommended apps pops up based on the apps you have been searching for or the apps that are currently installed on your smartphone. According to the survey, 34 percent of users download apps based on recommendations from app stores. For example, if you are downloading a music app, your app store will present you with a list of several other music apps that you may consider downloading. To reach out to their target customers, mobile apps designed by app developers are submitted on app stores where users can download or purchase the app after discovering them. Analysing the behaviour of users for discovering apps can help mobile app developers to come up with the right strategies for promoting their mobile app. Now let’s discuss the top motivating factors that excite people to install apps. What Motivates Users to Install Apps? Price is the most significant factor that motivates users to install an app discovered by them. According to the survey by Google and Ipsos, 85% of users are motivated by the price of the app. As far as paid apps are concerned, 50% of users prefer paying for an app only if the app offers the content they are looking for, or there is no free alternative for the app. The survey further establishes that 84% of users are motivated by privacy or app security and 71% of users are motivated by the utility as well as the description of the app. Furthermore, 66% of users install apps after determining how much memory an app would be using. App reviews and ratings by users serve as another motivating factor as 61% of users rely on app reviews and 60% rely solely on ratings for installing an app. Besides this, 28% of users are motivated to install an app if the app is used by a large number of users or by a majority of their friends and family. Last but not least, 20% of users, according to the survey install an app only after watching videos about the app. What Drives People to Use Mobile Apps? According to the survey, on an average 35 apps are installed by users on their smartphones. Of all the apps installed by mobile phone users, 52% of the apps are used on a regular basis. Of the 52% apps, 31% are used on a daily basis, whereas 21% of apps are used on weekly basis. The survey further revealed that 61% of people prefer using apps if they are easy to use and navigate. Besides this, 34% of surveyed users opined that they prefer using an app if it helps explore new things, whereas 26% of users value those apps that send them useful notifications regularly. Furthermore, 29% of smartphone users, according to the survey prefer personalizing the apps so as to derive the best experience, and 28% of users have a preference for apps that offer a large range of things to explore. Also, 19% of users admitted using an app if it belongs to the brand or company that they use frequently in real life. Some other valuable factors that make an app desirable are— its appearance, relevance, convenience, along with discounts and deals offered by the app. The frequency of app usage is again driven by several factors such as immediacy and convenience. If users do not find an app useful or convenient, they uninstall it immediately. Thus, even if a mobile app developer succeeds in getting a large number of users to install their app, the most difficult part is to spice up the apps in creative ways so as to keep users engaged so that they don’t end up uninstalling it. So what factors drive a user to abandon an app and what motivates them to use some apps repeatedly? Stay tuned for our next blog post in which we will throw light on these important aspects so that you can develop an effectual mobile-app marketing strategy.